Small and flexible allowing you to position your camera almost anywhere to help you capture the perfect shot. It can quickly and securely fasten to your camera within seconds. Lockable ball-and-socket joint gives quick 360 degree adjustability. Compact, lightweight and folds up for easy storage. Easily carry it with you anywhere you go in you. It compact only weighing 68g and a height of 17.5cm adding no noticeable weight in your camera bag. The Phot-R Mini Tripod is small and flexible and lets you position your camera almost anywhere to help you capture the perfect shot. Completely flexible and versatile, it simply & securely fastens to your camera in seconds. Featuring flexible leg joints that bend and rotate in all directions so you can wrap it securely to or on just about anything. Wrap it around poles, posts, railings, branches, rocks and much more Rubber feet grips provide enhanced stability on uneven surfaces. 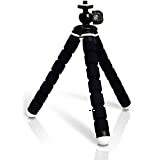 The tripod fits easily in your camera bag without adding noticeable weight – it weighs just 68g with height of 17.5cm! This entry was posted in Discount Photography and tagged 17.5cm, Cameras, Compact, Digital, DSLR, Flexible, Mini, PhotR, Small, Tabletop, Tripod, Universal by Ball Photo. Bookmark the permalink.